This particular Bugatti Type 41 Royale sold for over 20 million dollars at auction. Back in 1950, L’Ebe Bugatti, Ettore Bugatti’s daughter, let it go, along with another car, for a couple of refrigerators. There’s a good explanation why, but that doesn’t change the fact that this particular car, known as the Kellner car, probably has the most dramatic appreciation curve of any car ever. It’s probably worth clarifying exactly what sort of car the Bugatti Type 41 is. Let’s put it this way: the car was built because Ettore Bugatti heard some English lady comparing his cars unfavorably to a Rolls-Royce, and Ettore was not having it. He was determined to build a car that would make a Rolls-Royce look like a motorized tin turd with some naked, winged silver lady trying to jump off the grille of that shitbox. That’s not a literal description, but you get the idea. The car that resulted would end up costing twice what a Rolls-Royce cost, and the target demographic were people with royal titles and ancestors who may have claimed to be god. The Bugatti Type 41 Royale is one of the most massive cars ever built: 21 feet long, and weighing around 7000 freaking pounds of cast luxurite. To move all that opulence, there’s a 12.7-liter (yes, 12763 cc, or about a dozen original Mini Cooper engines) straight-eight, making nearly 300 horsepower. This was back in 1927, so 300 HP back then was probably conceptually like 1200 HP is today. It was a monster engine. Just to give you an idea of the scale of these engines, listen to this: there were leftover engines after the limited production run of the Royale, so these remaining engines were repurposed, in groups of two or four, to power railcars. That’s right, trains. These 12.7-liter monsters were sold to the French National Railway SCNF who used them in fast, sleek-looking Bugatti railroad engines. Let’s get back to the cars. The bodywork on the massive chassis was to be coachbuilt, according to the desires of the customer. Those customers were specifically intended to be royalty, but during the period the cars were released, 1928-1930, things weren’t really going so hot in the royalty business, and there was the start of an economic depression that was, by most accounts, great. The combination of a global economic downturn and Ettore’s high table manner bar conspired to limit production of the Type 41 to just six cars. The fifth car built, with a body by Kellner, is the one I want to talk about specifically. This car was never sold, and was kept by the Bugatti family. When World War II came around to make Europe miserable, the car was bricked up into a false wall along with a second Royale to keep it out of the hands of the Nazis. It worked, and the two cars survived the war. 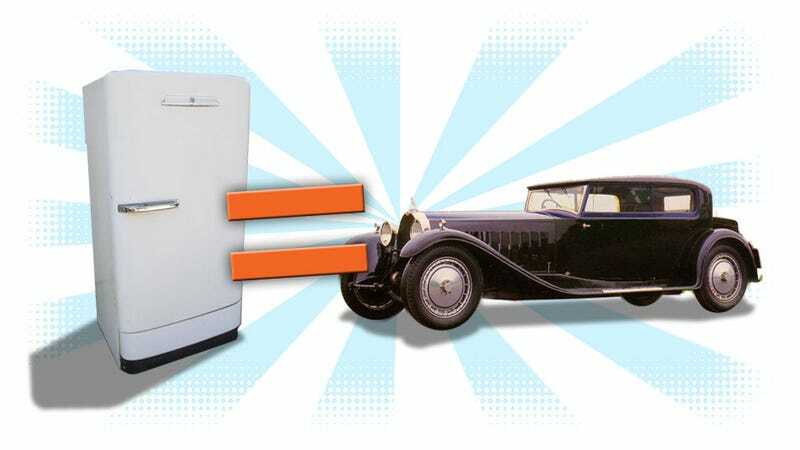 France was a shambles right after the war, and, in 1950, the Bugatti family decided it didn’t need two cars designed for kings, but instead could really use some refrigerators. New GE refrigerators were unavailable in post-war France, but American LeMans racer Briggs Cunningham happened to be able to get some, and was willing to trade a pair of fridges and about 200,000 francs (around $571!) in exchange for the two Type 41 Royales. So, that’s where I’m getting that headline: with two cars and two fridges, that’s basically a fridge per car, plus about $280 or so. Cunningham sold the other Type 41 pretty soon after he brought them to the U.S., in 1952, for $6500, which was a metric craptonne at the time (then the highest paid for a collector car) and made him a nice chunk of change. The Kellner car wound up in Cunningham’s museum until it closed in 1986, then was sold at auction for $9.7 million. Even not taking into account the later, higher sales, the profit made from buying a car for a fridge and a few hundred bucks to selling it for nearly ten million is pretty astounding, even when you factor in restoration costs and polish for that huge elephant hood ornament.